Members of the IMAGE group have recently published the first results from 40 hours of MUSE observations at the Very Large Telescope in the MUSE Ultra Deep Field. These observations reveal the presence of a group of three extended nebulae associated with a bright quasar pair at a redshift of 3.2, when the Universe was only 2 billion years old. 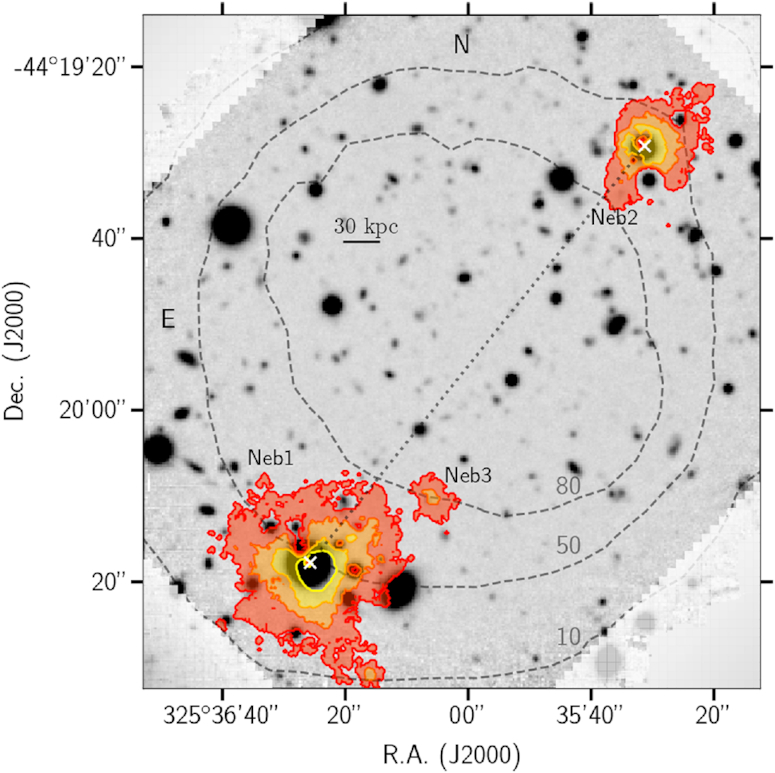 As shown in the figure, the alignment and shape of these nebulae offer a tantalising suggestion of the presence of large-scale filaments (orientation marked with a dotted line) connecting the two quasar host galaxies (marked with white crosses), in line with the expectation of simulations. Upcoming ultra-deep (up to 200 hours) MUSE observations in MUDF will enable a better view of the possible presence of the filament between the two quasars in the pair. A group of galaxies falling into a massive galaxy cluster in the Local Universe (A1367) has been observed with the MUSE integral field spectrograph at the ESO Very Large Telescope. The group, dubbed the Blue Infalling Group (BIG), is filled by a spectacular complex of ionized gas filaments (red colour the figure, superposed to the stellar light emission). The superior quality of MUSE data allowed an international team of researchers led by IMAGE group members to derive the past history of the group galaxies. One galaxy is found to a clear result of a merger of two lower mass systems, while another galaxy is currently being stripped of its atomic gas by hydrodynamic interactions in the group and cluster environments. Atomic gas is removed from the galaxy potentials both by gravitational and hydrodynamic interactions and it is heated-up during these processes allowing observations of a warmer and ionised gas phase. The researchers concluded that the combined effect of galaxy interactions in the group environment and hydrodynamic interactions with the group system as a whole can reduce the star formation activity of galaxies, leading star forming systems to become quiescent even before they reach the harsher environment of a massive cluster. This phenomenon, called “pre-processing”, is believed to be even more effective in the distant Universe at the epoch of the formation of the first group-like systems. 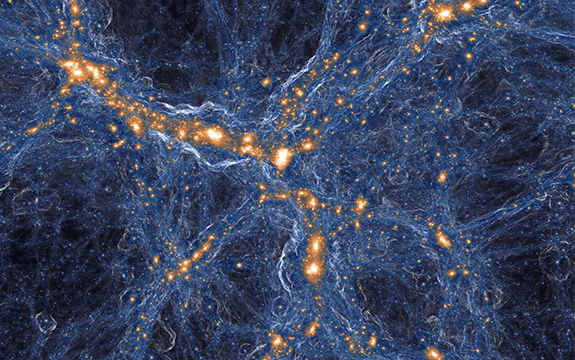 A relic cloud of gas, orphaned after the Big Bang, has been discovered in the distant Universe. The cloud is unpolluted by stars even 1.5 billion years after the Big Bang and offers new information about how the first galaxies formed. Gas in the Universe is usually polluted by waste from exploding stars, but the newly discovered cloud appears to be pristine. Due to its lack of heavy elements, researchers - including IMAGE member Michele Fumagalli - have concluded that it must be a true relic of the Big Bang. The fossil is one of only three such clouds ever found, following the discovery of two other similar relics in 2011. The researchers say that it is now possible to survey the skies for these fossil relics. This could tell us exactly how rare these gas clouds are and help us to understand how some gas formed stars and galaxies in the early Universe and why some did not. The figure shows simulation of galaxies and gas in the universe. Within the gas in the blue filaments connecting the orange galaxies lurk rare pockets of pristine gas. (Image credit: TNG Collaboration). 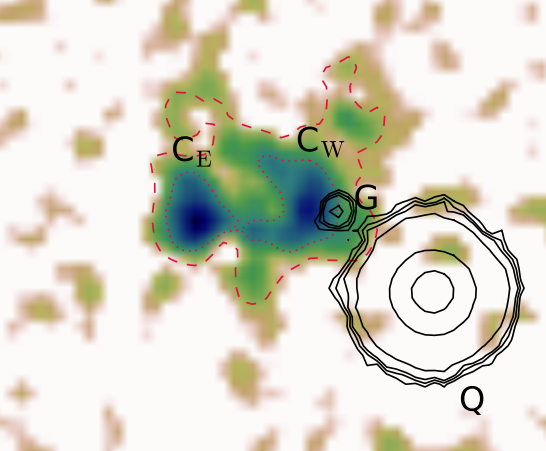 IMAGE member Elisabeta Lusso, in partnership with international collaborators, has recently reported on the detection of a blueshifted absorption feature from highly ionized iron in two consecutive XMM–Newton observations (red and blue data points in the figure, where green crosses represent the combined data) of the luminous blue quasar Ton 28. The rest energy in the X-ray (marked in the left panel at 9.2 keV) implies the presence of an accretion disc wind with a bulk outflow velocity of approximately 0.3 times the speed of light, and kinetic power of at least a few per cent of the quasar bolometric luminosity. In the figure, the blue area highlights the wind absorption feature. To understand whether ongoing powerful X-ray winds leave any distinctive signatures imprinted at other wavelengths on the intrinsic quasar spectrum, the authors developed a backwards selection method to single out a quasar in its so-called ``X-ray blow-out'' evolutionary phase, which is believed to represent the initial stage of quasar feedback. Provided that the effectiveness of this selection method is confirmed with sources similar to Ton 28, this result could represent the first step towards the characterization of the fastest black-hole winds through multiwavelength indicators in the absence of high-quality X-ray spectra. Members of the IMAGE group have been awarded 90 orbits on the Hubble Space Telescope to complete the deepest spectroscopic survey to date in the near infrared. This programme, co-led by scientists at the Space Telescope Science Institute in the US, will deliver very deep spectroscopy using the WFC3 grism to survey low-mass galaxies within the MUSE Ultra Deep Field, a region of the sky that contains two bright quasars and is targeted by ultra-deep MUSE spectroscopy. 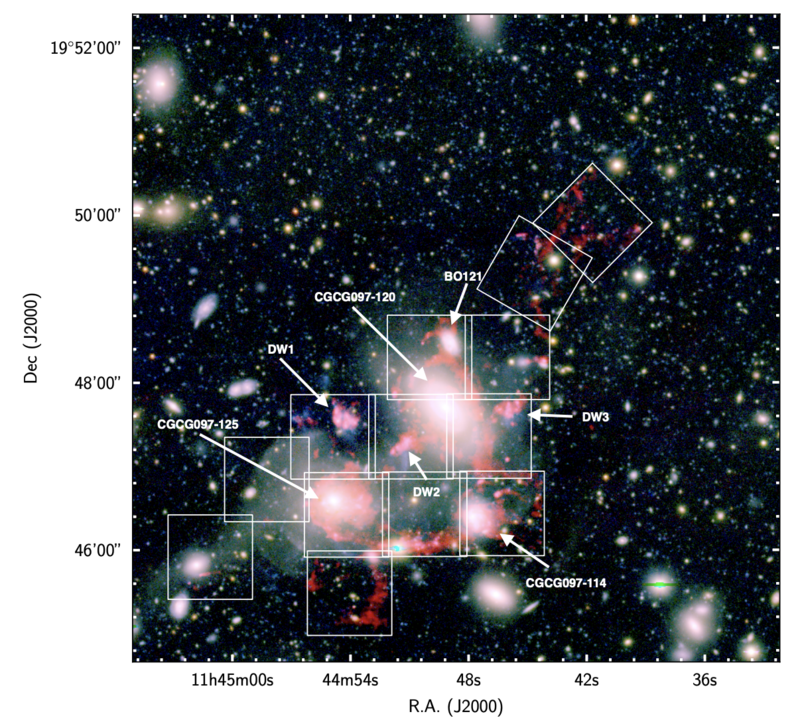 By combining the information encoded in these galaxy spectra with the absorption signatures present in the two quasar spectra, this programme will provide an unprecedented view of the distribution of gas and metals around low-mass galaxies at the peak of the cosmic star formation history (see figure above). Combined with MUSE observations, this programme will also provide novel insight into the physics of high redshift galaxies and their evolution in different environments. Members of the IMAGE group have recently reported the first determination of the primordial helium abundance based on a near-pristine intergalactic gas cloud that is seen in absorption against the light of a background quasar. 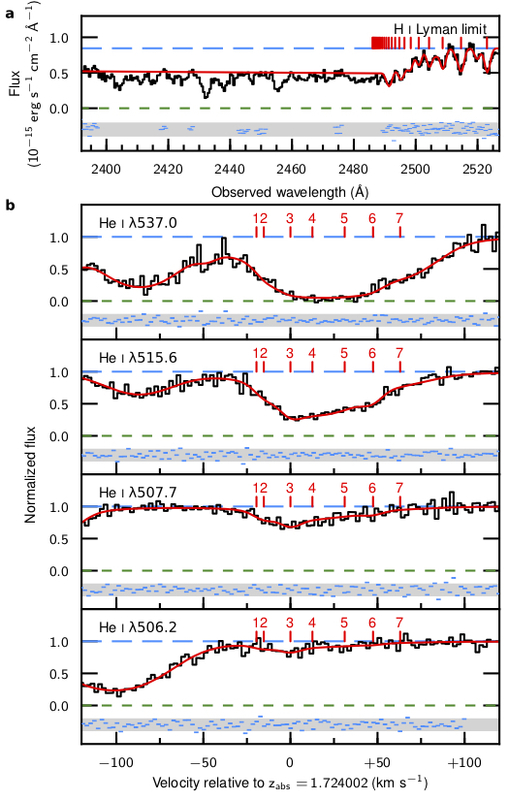 The figure above shows the absorption profiles from the hydrogen Lyman Limit (top panel) and a selection of neutral helium absorption lines (remaining panels). The red curves show a model fit to the data (black histogram), and the tick marks above each spectrum indicates the locations of the absorbing gas clouds that comprise the partial Lyman Limit System (pLLS). This pLLS, at a redshift z=1.724 (i.e. when the Universe was just one-third of its present age), has a metal content 100 times less than the Sun, and contains 30 per cent fewer metals than the most metal-poor H II region currently known where a determination of the primordial helium abundance is afforded. Since the primordial helium abundance offers a sensitive test of new physics beyond the Standard Model just a few minutes after the Big Bang, its determination is of acute interest in cosmology. This study reports a 10 per cent measure that agrees with the Standard Model value. 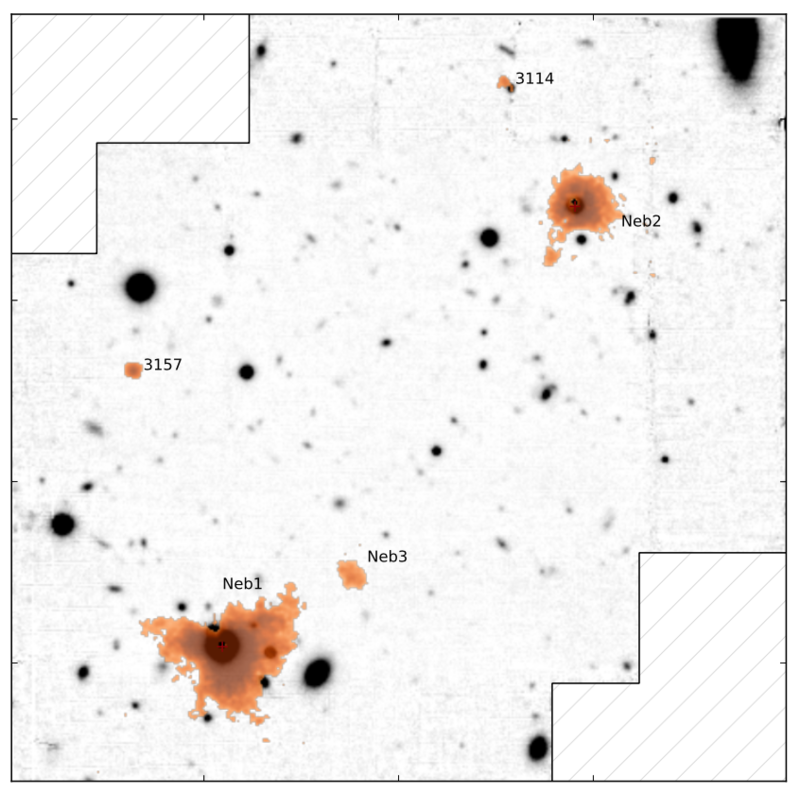 Members of the IMAGE group have conducted a survey to observe 54 closely projected quasar pairs at similar cosmological distances with the Wide Field Camera 3 on-board the Hubble Space Telescope. These quasar pairs act as double flashlights, piercing the tenuous environment in two sightlines, thus providing a 2-D map of both the large and small-scale structure of the cosmic web. The first results of this campaign reveal that these closely-projected quasar pairs show moderate excess of gas absorbing Lyman continuum photons compared to single quasars. By measuring the path of ionising photons and constructing a composite ultraviolet spectrum of pairs -- shown in figure -- IMAGE members found that the shape of the composite spectrum of pairs differ from the one of single quasars in the extreme ultraviolet. This is indicative of an excess of gas absorbing Lyman continuum photons, as also seen when measuring the mean free path (i.e. how far photons travel in the Universe before being absorbed) of ionising photons as a function of redshift. This excess of gas is thought to arise within large-scale structures or partially neutral regions inside the dark matter halos where the close pairs reside. Members of the IMAGE group have been awarded a new ESO Large Programme. In partnership with international collaborators, IMAGE members will use the MUSE instrument at the VLT to acquire the deepest spectroscopic observations (for up to 150 hours) ever collected in a field with multiple quasars. Building on a successful pilot programme that has revealed extended hydrogen Lyman-α emission near these quasars (red in the Figure showing an image reconstructed from our pilot MUSE data), the newly-awarded programme aims at acquiring a detailed view of the cosmic web that is expected to connect galaxy halos in the early universe. 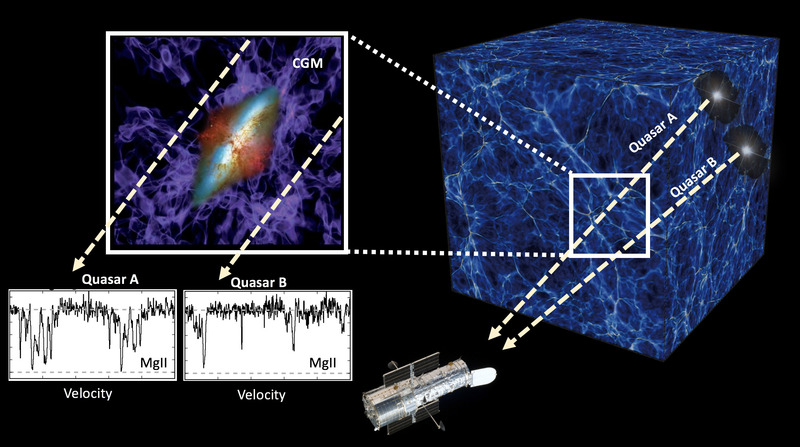 Thanks to the groundbreaking capabilities of MUSE, these data will also provide a wealth of information on the physics of gas near galaxies and in groups across 5 billion years of cosmic history, and will form one of the deepest spectroscopic surveys in blank fields. IMAGE member Ryan Cooke has recently reported a one per cent determination of the primordial deuterium abundance. Assuming the Standard Model of particle physics and cosmology, this measurement corresponds to a Universal density of baryons in good agreement with the recent measurement derived from the Cosmic Microwave Background temperature fluctuations recorded by the Planck Satellite. The figure above shows seven high precision measurements of the deuterium to hydrogen ratio over a broad range of metallicity (blue symbols). The weighted mean of these seven independent measurements is shown by the red horizontal lines. The grey horizontal band shows the Planck measure of the baryon density, assuming the Standard Model. IMAGE member Michele Fumagalli has been awarded a prestigious Starting Grant, worth 1.5 million euros, from the European Research Council. The grant will fund several students and postdocs over the next 5 years to work within the IMAGE group on the project entitled "A new vantage point on how gas flows regulate the build-up of galaxies in the early universe". This project will focus on understanding the inflow and outflow of gas from galaxies and into the wider cosmic web — a process that regulates star-formation and the evolution of galaxies across cosmic time. The research will tackle the dual questions of how gas accretion regulates the build-up of galaxies and how efficiently outflows remove gas from star-forming regions within galaxies, using both state-of-the art simulations and new observational techniques. 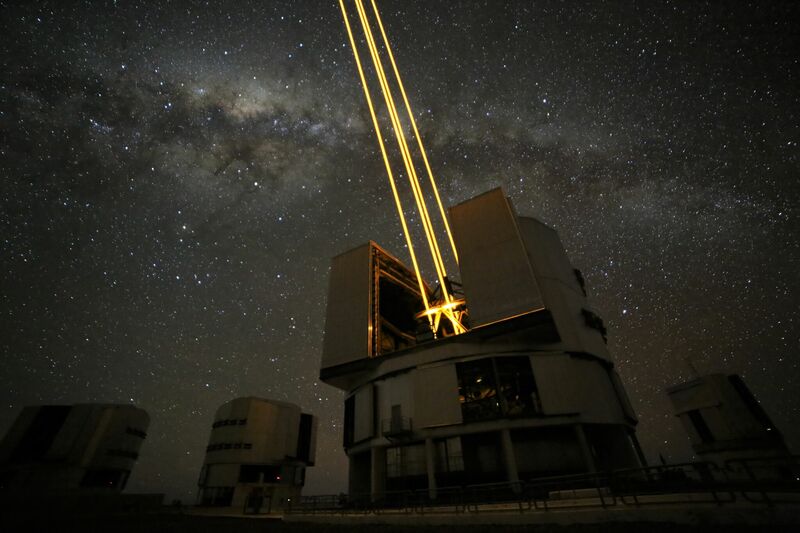 On the night of August 15, IMAGE members were the first visiting scientists to turn on the four powerful lasers (shown here in a picture by IMAGE member Ruari Mackenzie) of the recently-commissioned GALACSI system at VLT/UT4. With the aid of the new adaptive-optics system, MUSE observations of a sky region known to host three physically-associated quasars were collected with an exquisite image quality of less than 0.5 arcsec. These data will enable a detailed study of the environment surrounding these bright quasars, as well as of the intergalactic medium probed by multiple closely-spaced lines of sight. Click here to watch a video by Ruari Mackenzie of the UT4 lasers. An extended nebula - one billion times larger than the distance between the Earth and the Sun - has been uncovered by members of the IMAGE group next to a damped Lyman-α system (DLA), a dense gas cloud rich in neutral hydrogen and heavy elements. Located at a large cosmological distance, DLAs are believed to trace the reservoir of neutral hydrogen next to galaxies that are assembling a few billion years after the Big Bang. This nebula (shown in the Figure above) is one of the largest known to date next to a DLA, and is believed to be a signpost of an extended cosmic structure within which multiple galaxies are assembling. While commonly predicted by cosmological simulations, these structures have been mostly elusive so far. 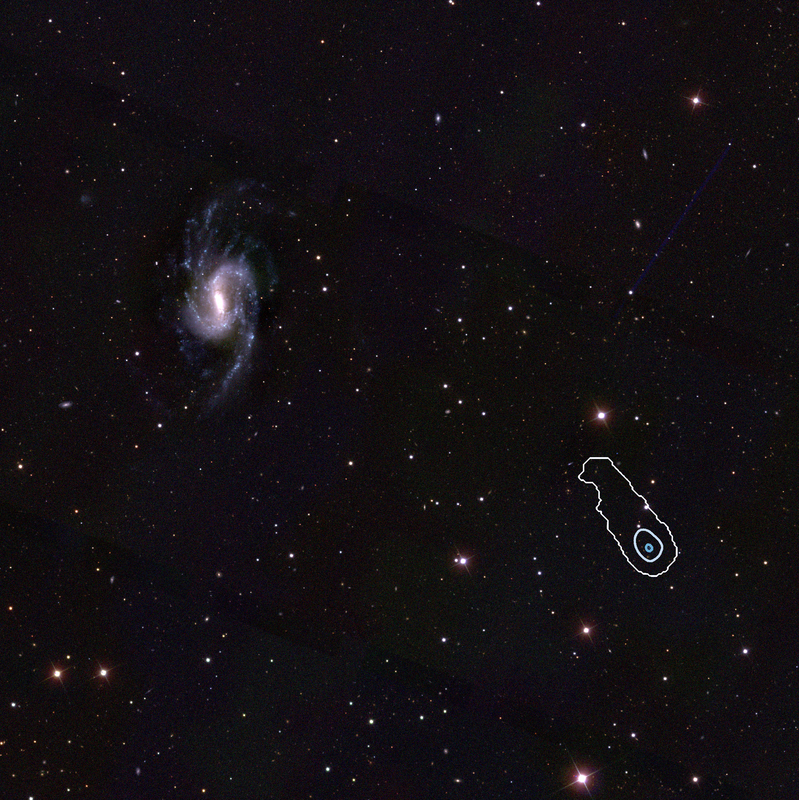 However, equipped with the MUSE instrument of the European Southern Observatory’s Very Large Telescope, IMAGE members are on the lookout for even more examples of these nebulae near DLAs, which can provide new clues about how galaxies form inside cosmic filaments by converting gas into stars. Click here to read the discovery paper. A near-pristine galaxy (nicknamed the Little Cub, because it is located in the Ursa Major, or Great Bear, constellation) has recently been discovered by members of the IMAGE group at Durham (Little Cub is located in the inner blue contour in the figure above). Little Cub is among the most metal-poor star forming galaxies currently known and is being cannibalised by a nearby grand design spiral galaxy (NGC 3359 - the spiral galaxy seen in the figure above). The discovery has enabled us to learn about the processes that strip low mass galaxies of their gas and stars. The discovery also allows us to study the genesis of the first chemical elements (including hydrogen and helium), that were created just minutes after the Big Bang. Click here to find out more and click here to read the discovery paper. 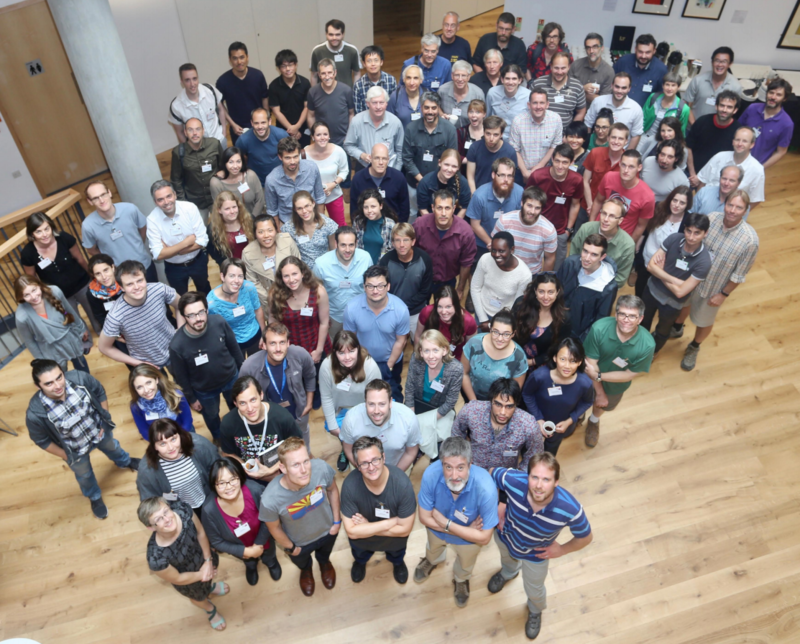 Over 100 scientists from around the globe gathered at Durham University for the conference "What Matter(s) Around Galaxies: Resolving the physics of the circumgalactic medium", which took place between the 19th and 23rd of June 2017. Under the attentive supervision of IMAGE members involved in the local and scientific organisation, participants presented and discussed the latest developments in our understanding of the circumgalactic medium. Talks covered a wide range of topics, focusing on the use of different methodologies (analytic theory, numerical simulations, observations) and tracers (from radio to optical, to X-ray) to address key open questions on the nature of the circumgalactic medium. Visit the conference website for more information and for the PDFs of the talks. Fluorescent emission - a red glow that appears when ultraviolet (UV) light interacts with gas - has been observed near the edge of the UGC 7321 galaxy at 30 million light years from Earth. Members of the IMAGE group in collaboration with European and US scientists, pointed the MUSE instrument of the European Southern Observatory’s Very Large Telescope to map the red light produced by the UV radiation illuminating the gas in UGC 7321. By measuring the intensity of this very faint glow - shown in an artistic impression in the above Figure - it has been possible to infer the presence of the elusive UV background. This study paves the ground for new ways to map the temperature of the cosmos and to understand why there are so few small galaxies in the Universe. Click here to find out more and click here to read the paper. Group discussion of the latest science highlights from IMAGE. See calendar of events for the schedule of the upcoming meetings. In-depth discussion of recent papers on topics of interest to the IMAGE group. All are welcome to join. See calendar of events for the times of the upcoming meetings together with title of the papers for discussion.